Tia Bougher Caity O’Rourke Damien Sweet. 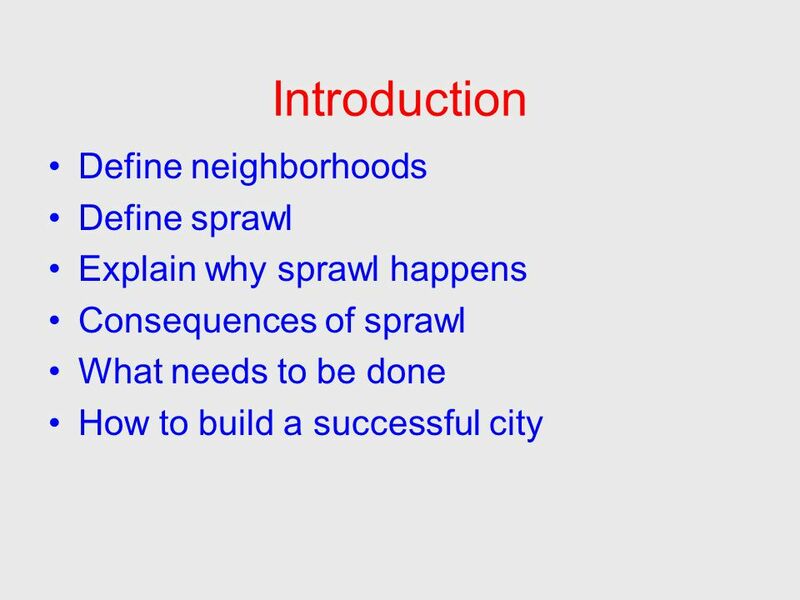 Introduction Define neighborhoods Define sprawl Explain why sprawl happens Consequences of sprawl What needs. 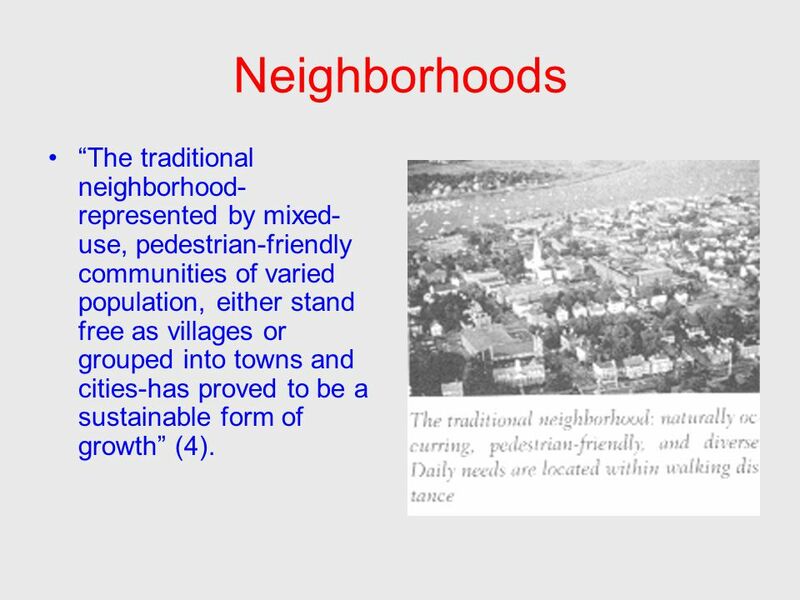 3 Neighborhoods “The traditional neighborhood- represented by mixed- use, pedestrian-friendly communities of varied population, either stand free as villages or grouped into towns and cities-has proved to be a sustainable form of growth” (4). 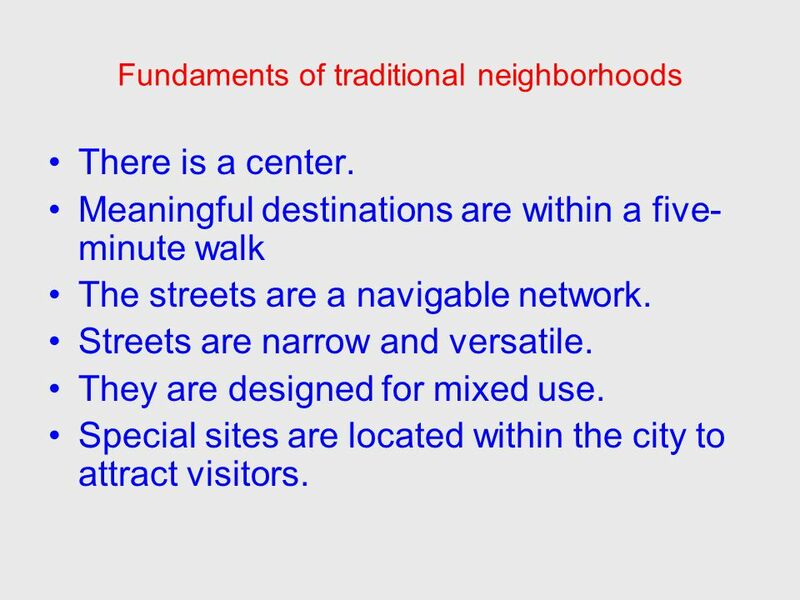 4 Fundaments of traditional neighborhoods There is a center. 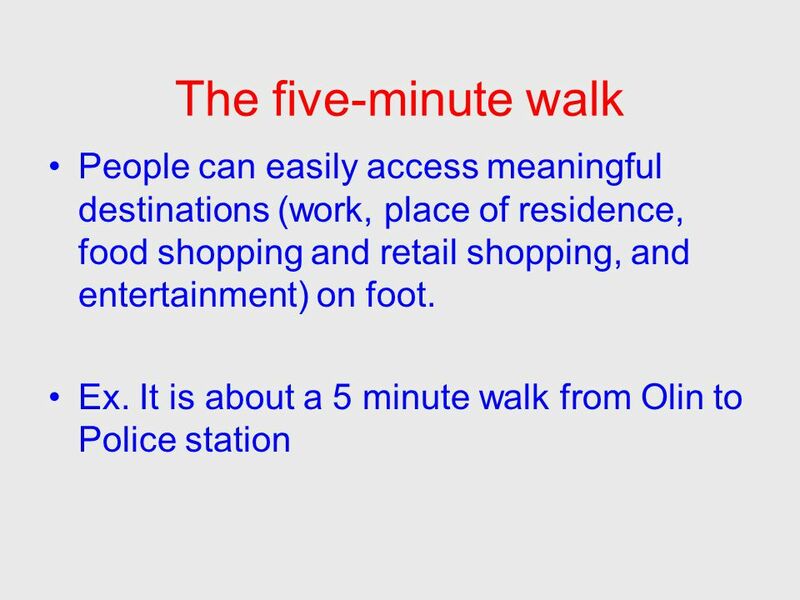 Meaningful destinations are within a five- minute walk The streets are a navigable network. Streets are narrow and versatile. They are designed for mixed use. Special sites are located within the city to attract visitors. 5 The center The center is the focal point within a designated neighborhood. Local activities of commerce, culture, and governance take place here. 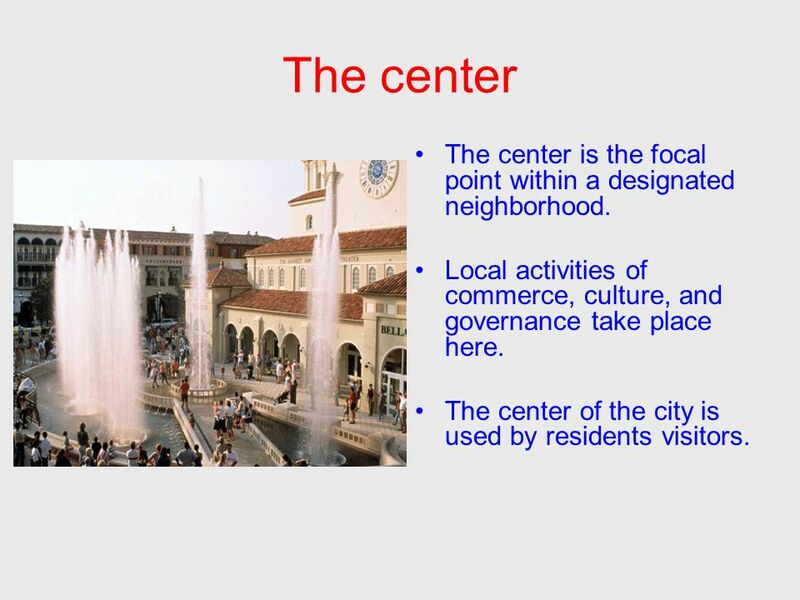 The center of the city is used by residents visitors. 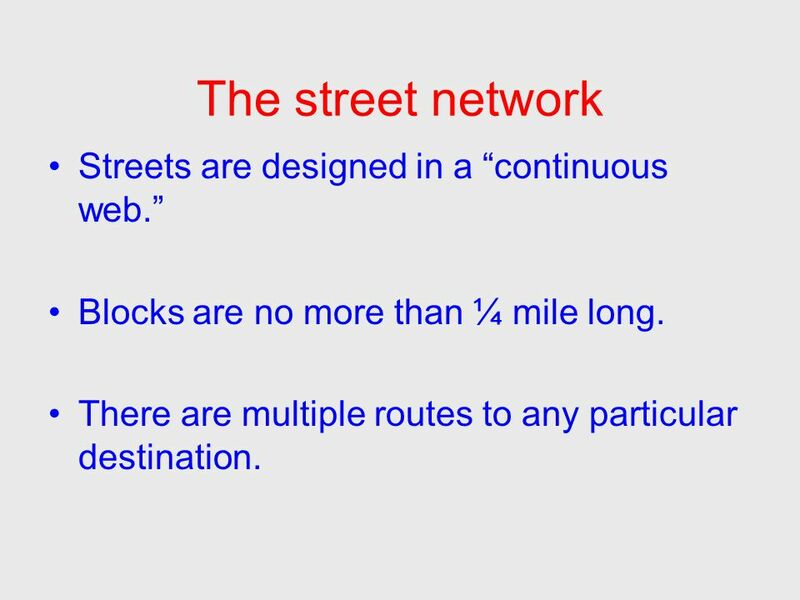 7 The street network Streets are designed in a “continuous web.” Blocks are no more than ¼ mile long. There are multiple routes to any particular destination. 9 Mixed Use The downtown area has multiple uses. 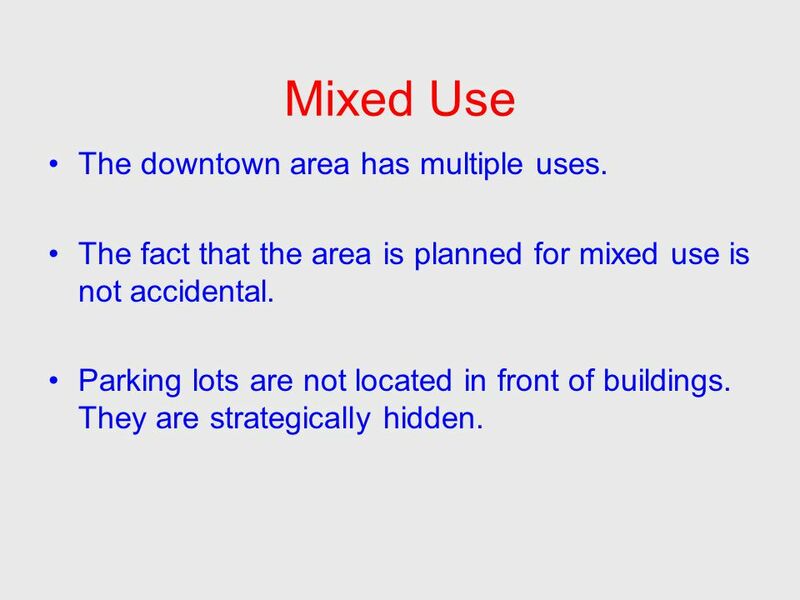 The fact that the area is planned for mixed use is not accidental. 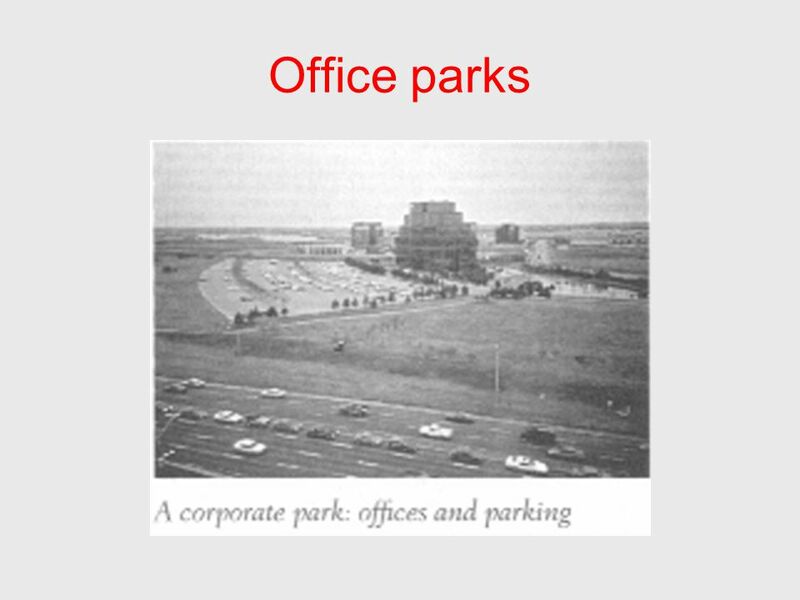 Parking lots are not located in front of buildings. They are strategically hidden. 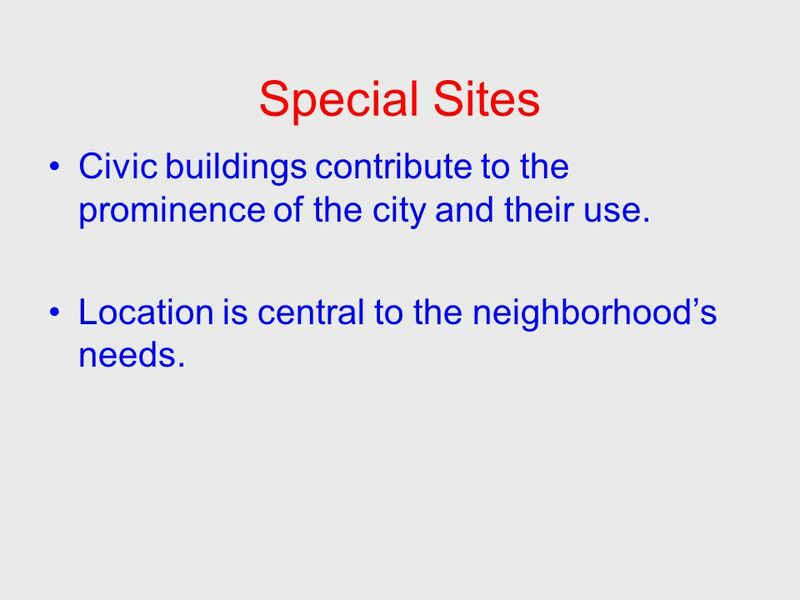 10 Special Sites Civic buildings contribute to the prominence of the city and their use. Location is central to the neighborhood’s needs. 11 Defining Sprawl Growth away from a city’s core, or downtown area. 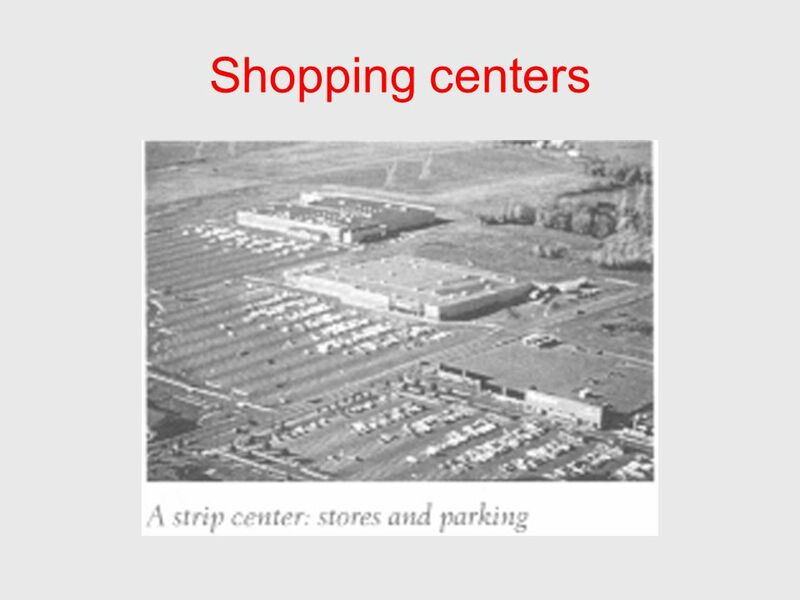 Sprawl is organized so that “neighborhoods” are filled with like buildings with similar uses. 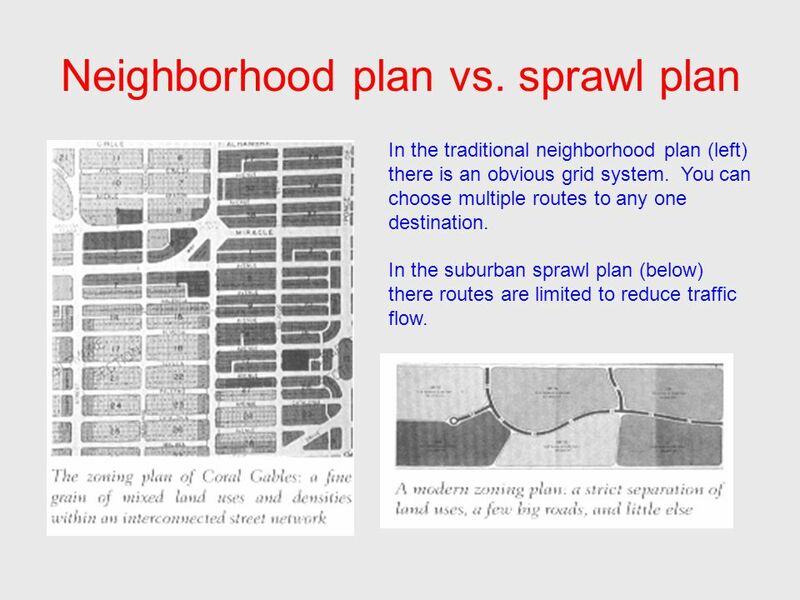 18 Neighborhood plan vs. sprawl plan In the traditional neighborhood plan (left) there is an obvious grid system. You can choose multiple routes to any one destination. In the suburban sprawl plan (below) there routes are limited to reduce traffic flow. 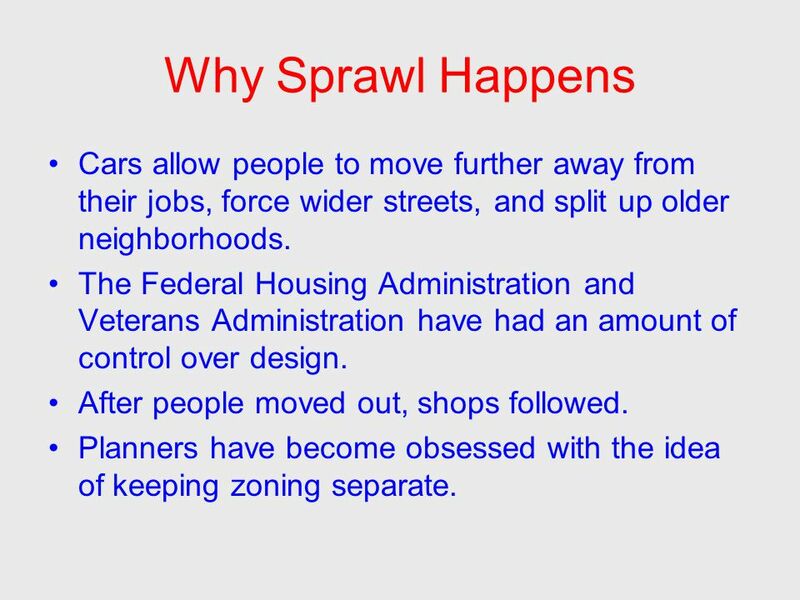 19 Why Sprawl Happens Cars allow people to move further away from their jobs, force wider streets, and split up older neighborhoods. The Federal Housing Administration and Veterans Administration have had an amount of control over design. After people moved out, shops followed. Planners have become obsessed with the idea of keeping zoning separate. 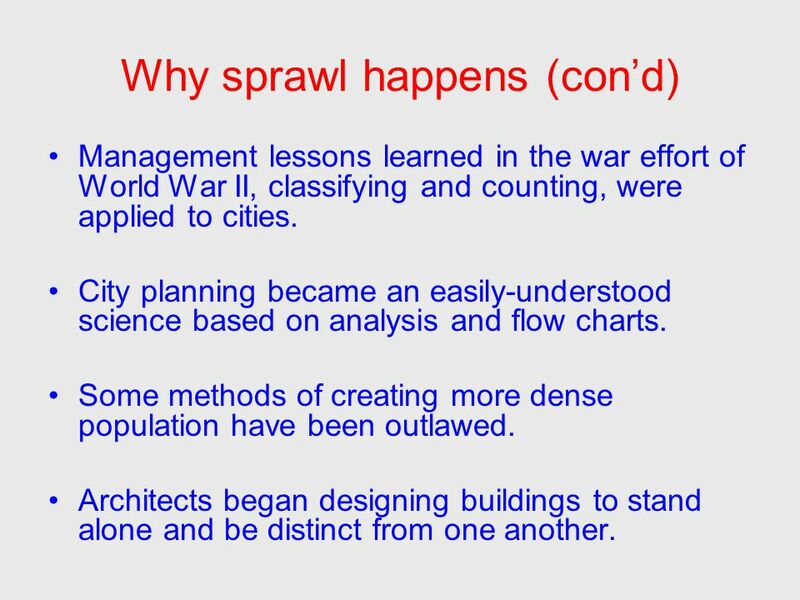 20 Why sprawl happens (con’d) Management lessons learned in the war effort of World War II, classifying and counting, were applied to cities. City planning became an easily-understood science based on analysis and flow charts. Some methods of creating more dense population have been outlawed. Architects began designing buildings to stand alone and be distinct from one another. 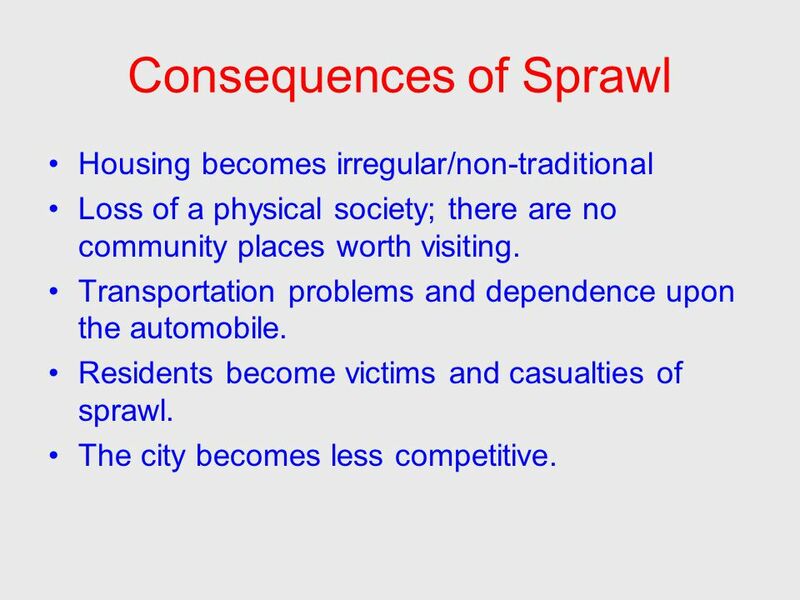 21 Consequences of Sprawl Housing becomes irregular/non-traditional Loss of a physical society; there are no community places worth visiting. 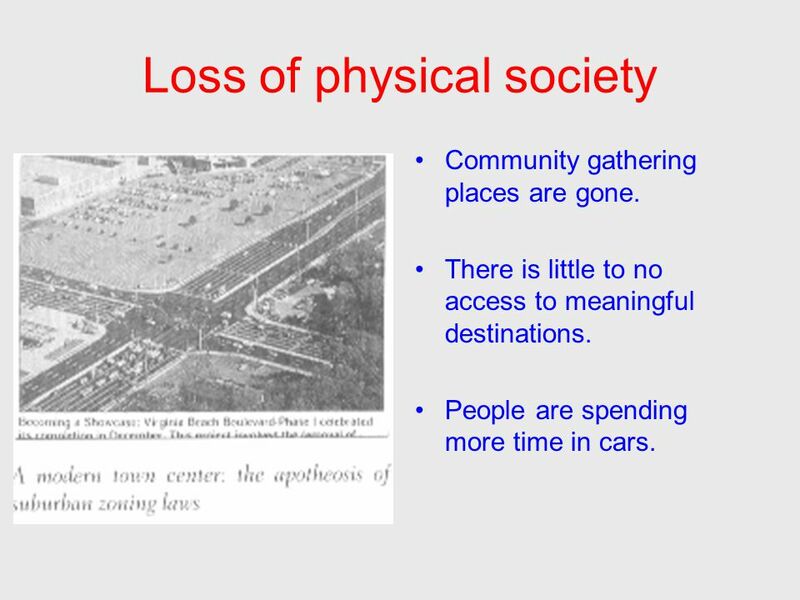 Transportation problems and dependence upon the automobile. 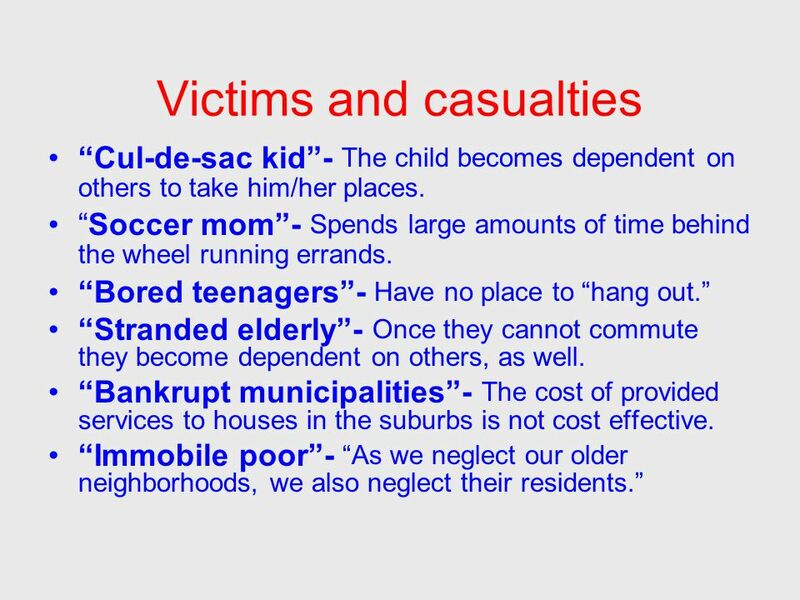 Residents become victims and casualties of sprawl. 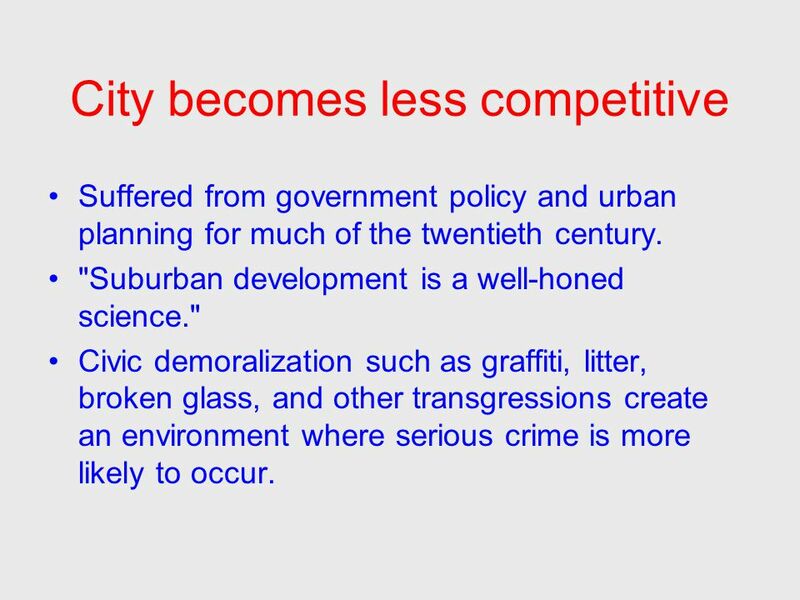 The city becomes less competitive. 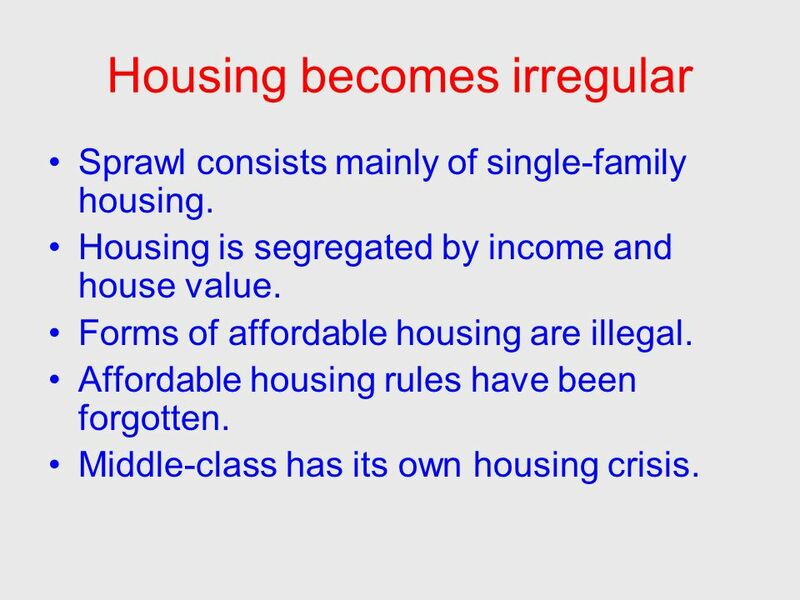 22 Housing becomes irregular Sprawl consists mainly of single-family housing. 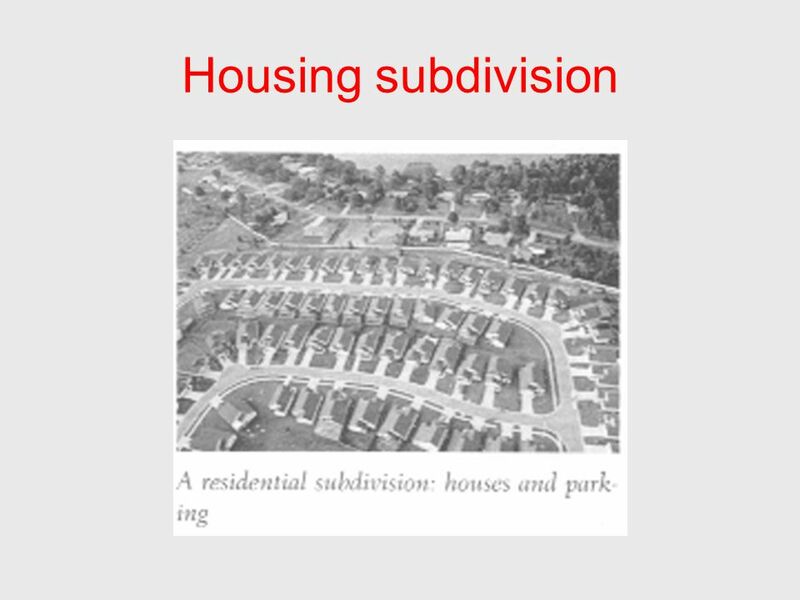 Housing is segregated by income and house value. Forms of affordable housing are illegal. Affordable housing rules have been forgotten. Middle-class has its own housing crisis. 24 Loss of physical society Community gathering places are gone. There is little to no access to meaningful destinations. People are spending more time in cars. 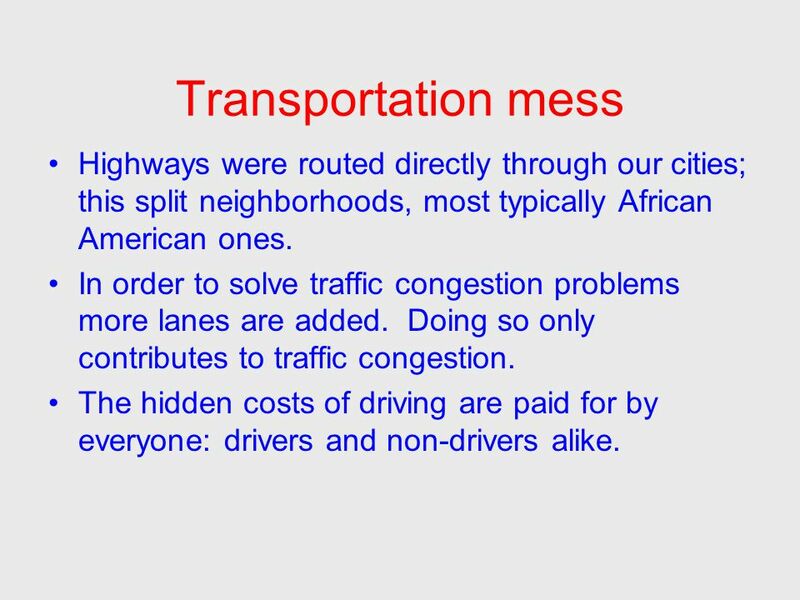 25 Transportation mess Highways were routed directly through our cities; this split neighborhoods, most typically African American ones. In order to solve traffic congestion problems more lanes are added. Doing so only contributes to traffic congestion. The hidden costs of driving are paid for by everyone: drivers and non-drivers alike. 27 City becomes less competitive Suffered from government policy and urban planning for much of the twentieth century. 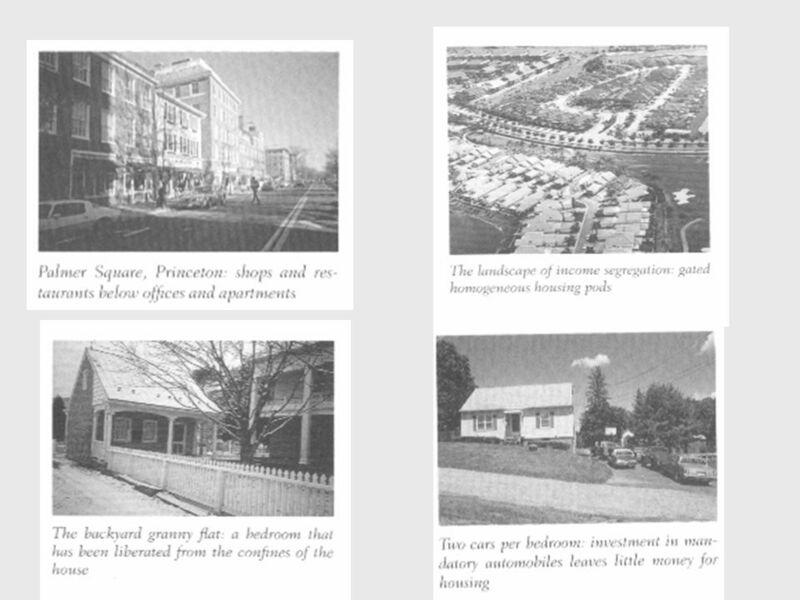 "Suburban development is a well-honed science." Civic demoralization such as graffiti, litter, broken glass, and other transgressions create an environment where serious crime is more likely to occur. 28 What should be done? 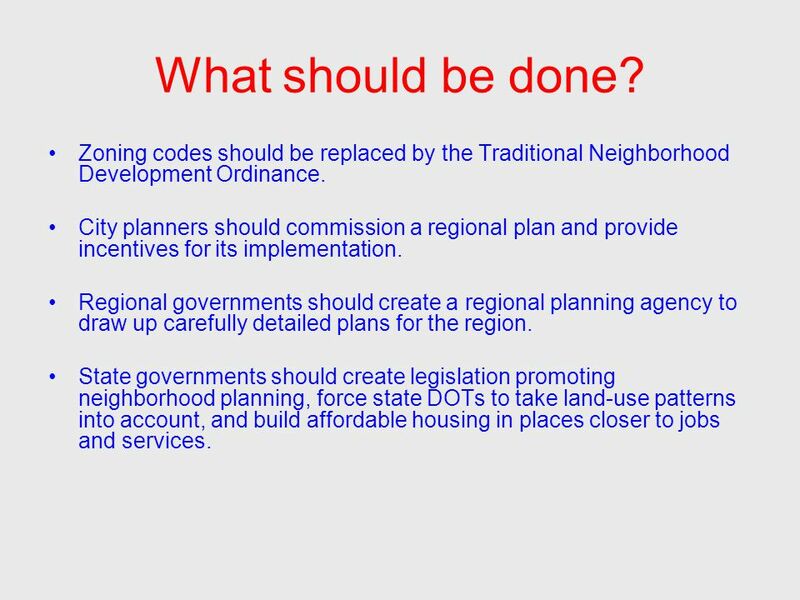 Zoning codes should be replaced by the Traditional Neighborhood Development Ordinance. City planners should commission a regional plan and provide incentives for its implementation. Regional governments should create a regional planning agency to draw up carefully detailed plans for the region. State governments should create legislation promoting neighborhood planning, force state DOTs to take land-use patterns into account, and build affordable housing in places closer to jobs and services. 29 What should be done? 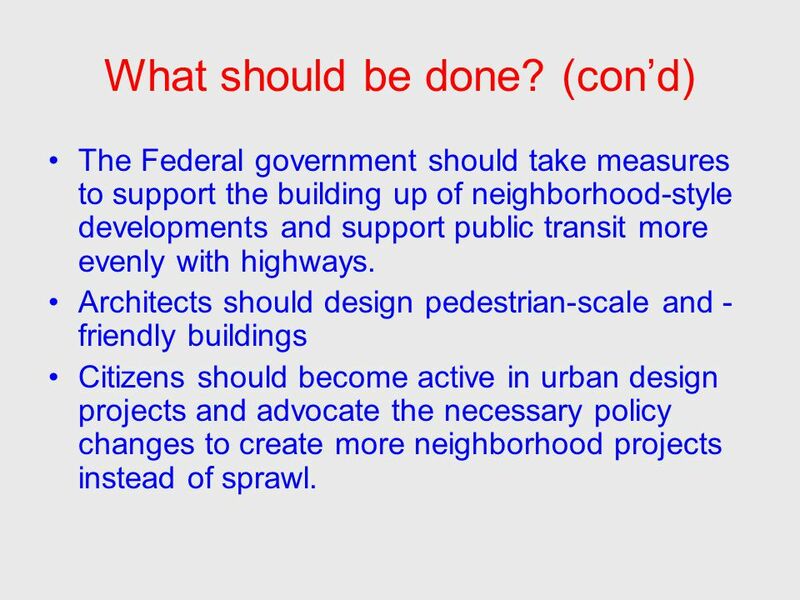 (con’d) The Federal government should take measures to support the building up of neighborhood-style developments and support public transit more evenly with highways. 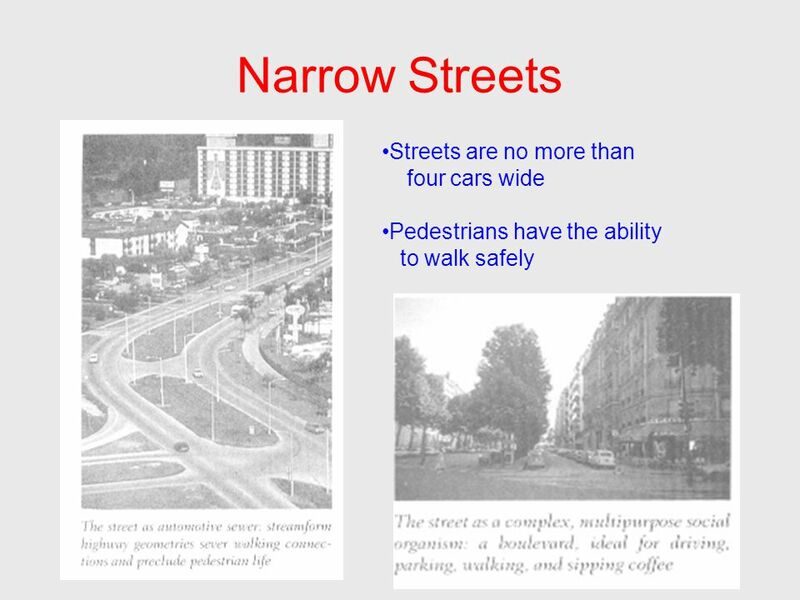 Architects should design pedestrian-scale and - friendly buildings Citizens should become active in urban design projects and advocate the necessary policy changes to create more neighborhood projects instead of sprawl. Download ppt "Tia Bougher Caity O’Rourke Damien Sweet. 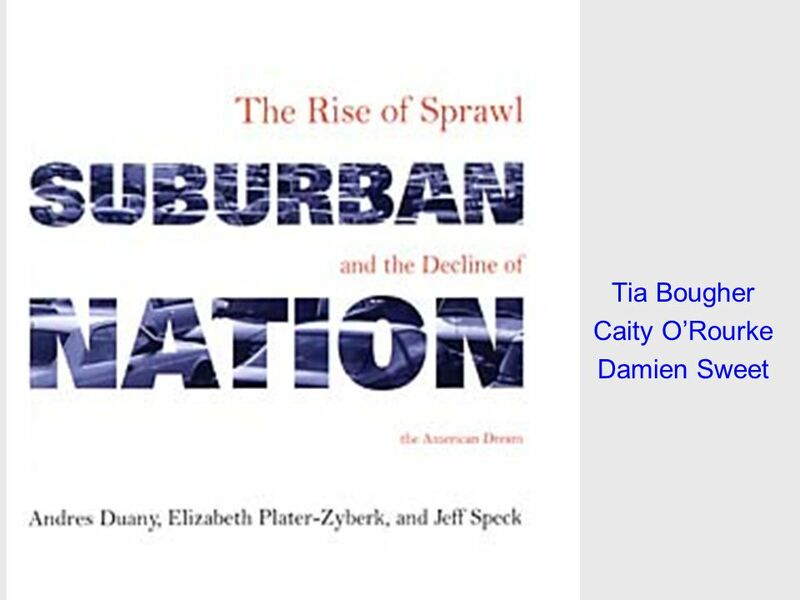 Introduction Define neighborhoods Define sprawl Explain why sprawl happens Consequences of sprawl What needs." Can A Schools Location Make A Kid Fat? Arizona Safe Routes To School Program. What is your Quality of Life like? Quality of Life – How content people are with their lives and with the environment in which they live. A Presentation by Alec McHarg on Regional and Urban Sustainable Issues… As part of a sustainable and Socially Cohesive Society… Deep in our culture is. 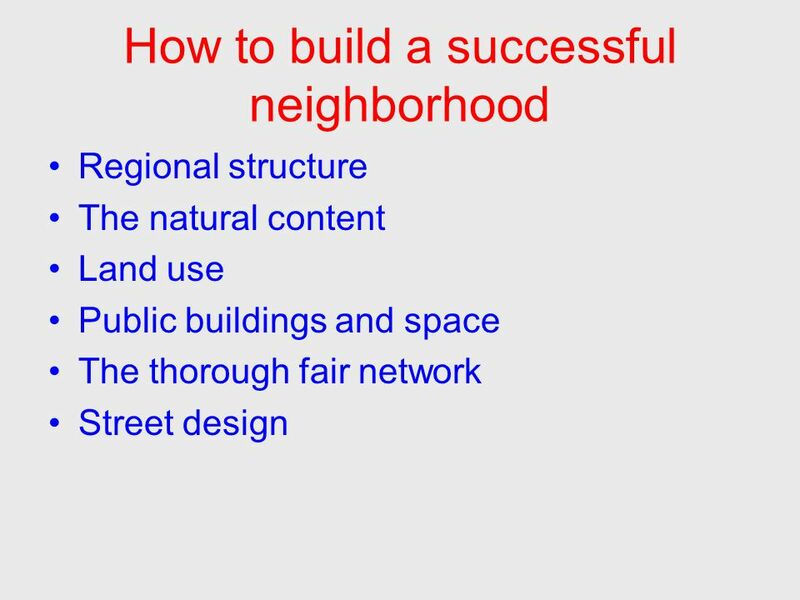 Presentation Outline What is a Healthy Neighborhood? Planning Trends and Impacts on Health Planning Tools for Healthy Communities. Urban Sprawl. 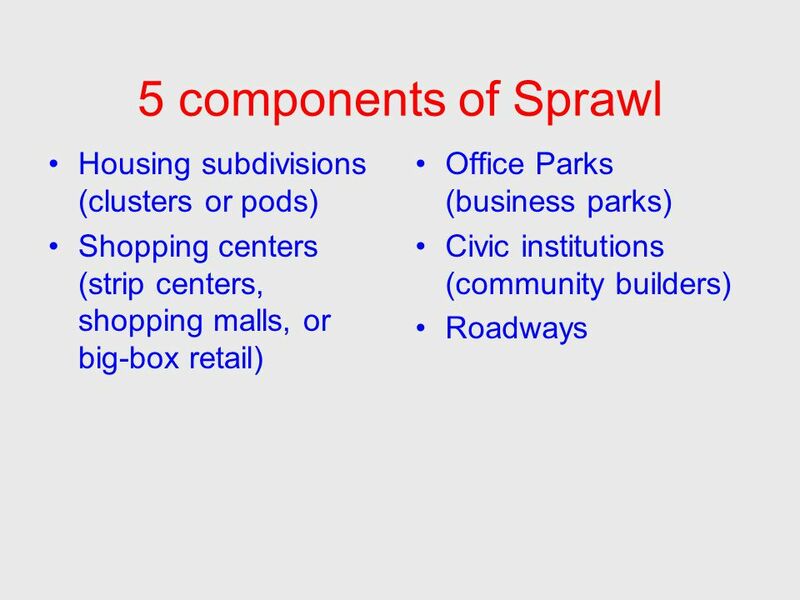 What is Sprawl? 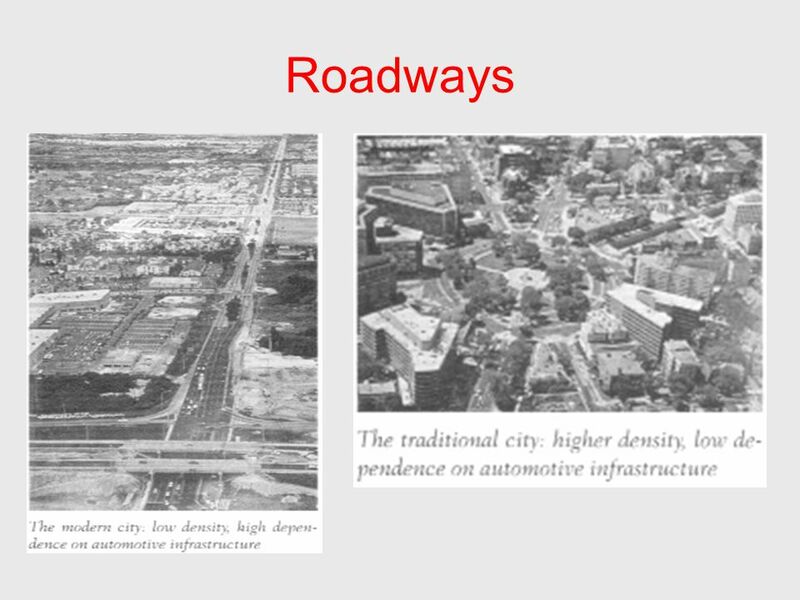 Sprawl is dispersed, auto- dependent development outside of compact urban and village centers, along highways, and in rural. Smart Growth / Smart Energy Toolkit Traditional Neighborhood Development Traditional Neighborhood Development (TND) Smart Growth / Smart Growth Toolkit. Urban Sprawl. 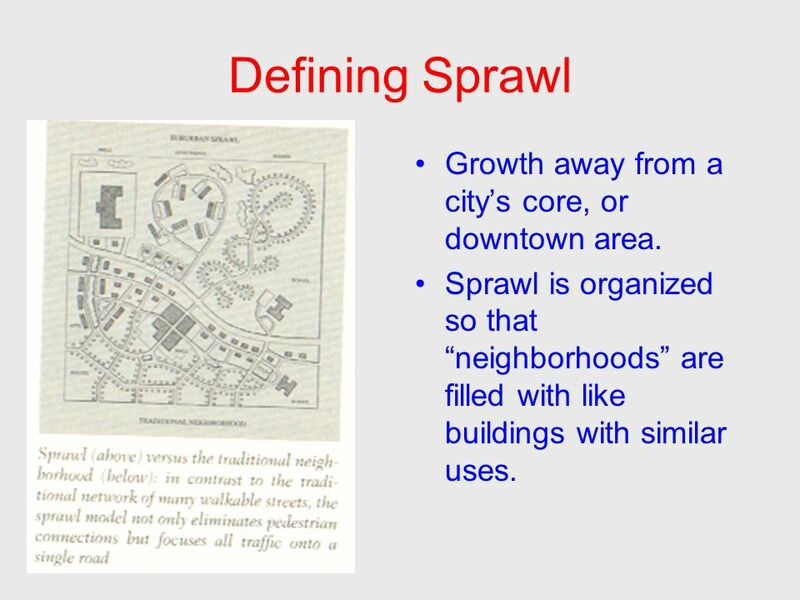 Definition Our textbook definition for urban sprawl is the rapid, often poorly planned spread of development from an urban area outward. Let’s Take a closer look…. A city grows outward from a central area in a series of concentric rings. The size and width of the rings may vary. Applying New Urbanist land use and urban design principles in Austin. Review for the Final.  There was part of a line on the survey that shouldn’t have been there. If you haven’t already filled out the survey, please disregard. THE COSTS OF SUBURBAN SPRAWL AND URBAN DECAY. 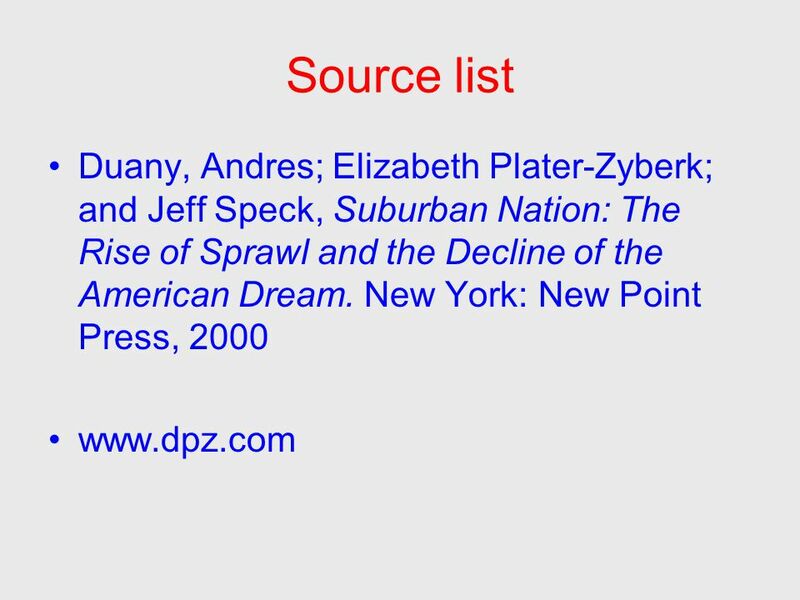 What is Suburban Sprawl? Sprawl is unsustainable development that wastes tax dollars, destroys farmland. SUBURBAN SPRAWL. What Causes it? 1.White flight 2.Technology 3.Government subsidizes 4.Space/Land/Entropy 5.Personal Preferences 6.Government Policies. Materials developed by K. Watkins, J. LaMondia and C. Brakewood TODs & Complete Streets Unit 6: Station Design & Access. 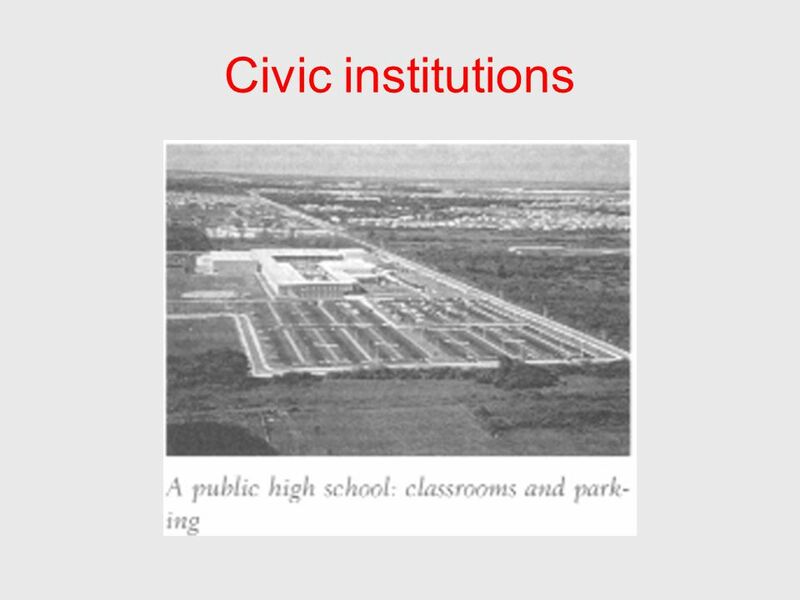 The Charter for the Congress on New Urbanism Edited and annotated by Robert Kleidman, Cleveland State University, for classroom use The full Charter can.